Published on December 3, 2017 in Uncategorized. Closed Tags: 2017, antifascism / antiracism, border deaths, death at border, greece, Lesbos, memorial, struggles and resistance, Thermi. 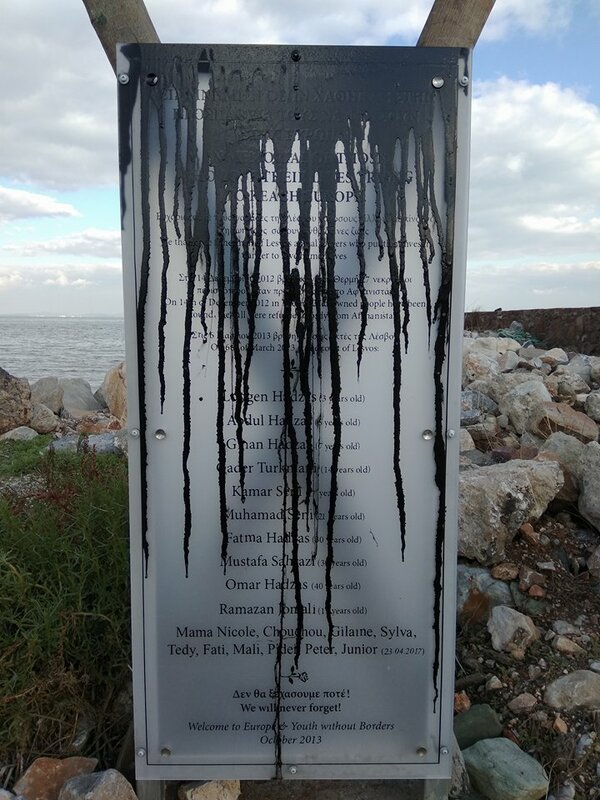 In the night of the 24th of November 2017, by the harbour of Thermi on Lesvos Island, unidentified persons vandalised the memorial that we had erected there in 2013. It carries the names of those who had drowned on their journeys to Europe. Two wooden paddles hold the plaque with the names of the dead and the memorial looks out to the sea, dedicated to those of all ages and backgrounds, whose lives ended at sea. On the memorial plaque, we thank the fishermen and all others who endangered their own lives when rescuing others, or when retrieving the dead from the water. Written on the plaque are the names of refugees who drowned in this area in 2013, but also of others who were later found all over the beaches of Lesvos. Gader Turkamni, who was 14 years old and lived in Athens with his family, had returned to Syria to attend a funeral. Unable to legally return to Greece, he was forced to travel in a dinghy. Fatma Hadjas and her three children Lodgen (3 years), Abdul (6 years) and Ginan (7 years) – her husband and their father lived in Athens and they escaped war to come and live in peace with him. Ramazan Jomali, who was 19 years old when he died, was awaited by his brother in Greece, who had come from Paris to meet him.